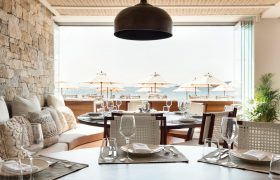 A peek under the 400-pleated fustanellas and elaborate uniforms worn by the elite Evzones, a real labour of love, embroidered and hand-crafted by the 10-member tailoring department of the Presidential Palace. A photo essay on a unique tailoring tradition by Angelos Giotopoulos. 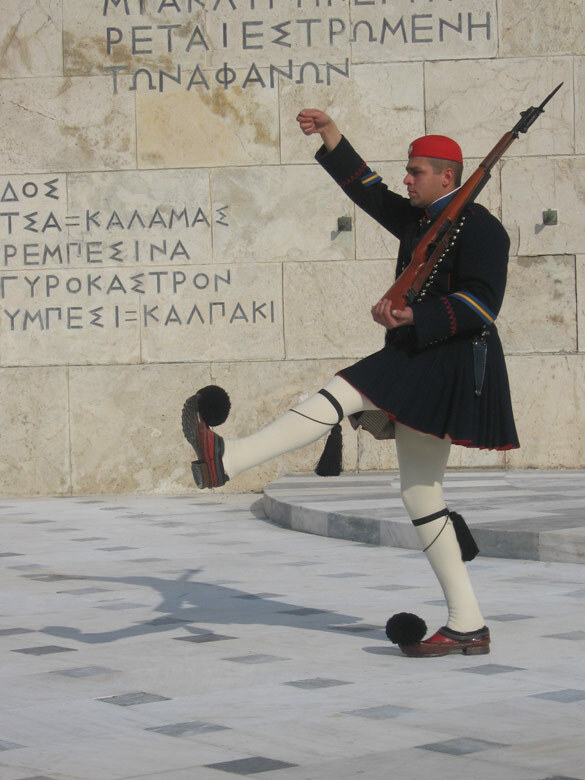 Often the most-photographed subjects of tourists, the 6 foot-tall Evzones (the well-belted, literally) who form part of the Presidential Guard (Proedriki Froura), are as much a symbol of Athens as its other historic landmarks are. 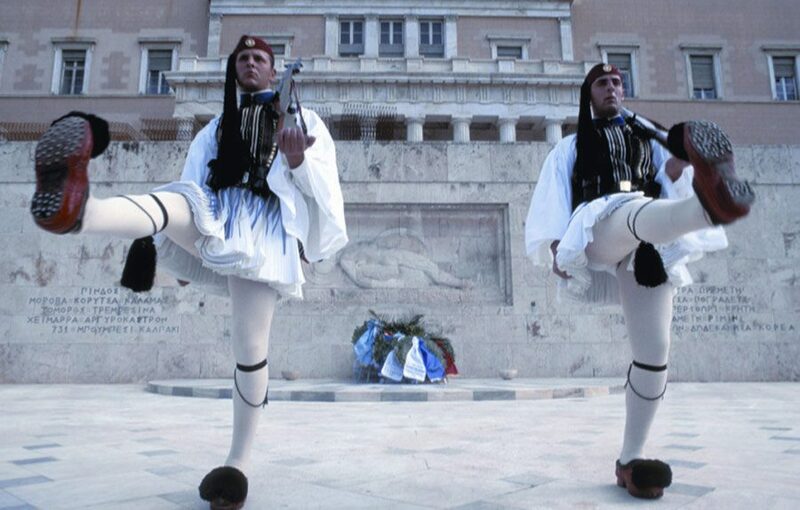 On an average, an Evzone spends 100 hours a week on his feet, weighed down by his rather bulky uniform – and performs his duties unflinchingly, under conditions ranging from scalding temperatures to braving tear-gas used to disperse demonstrators, often under the intense scrutiny of around 11,000 spectators a day! 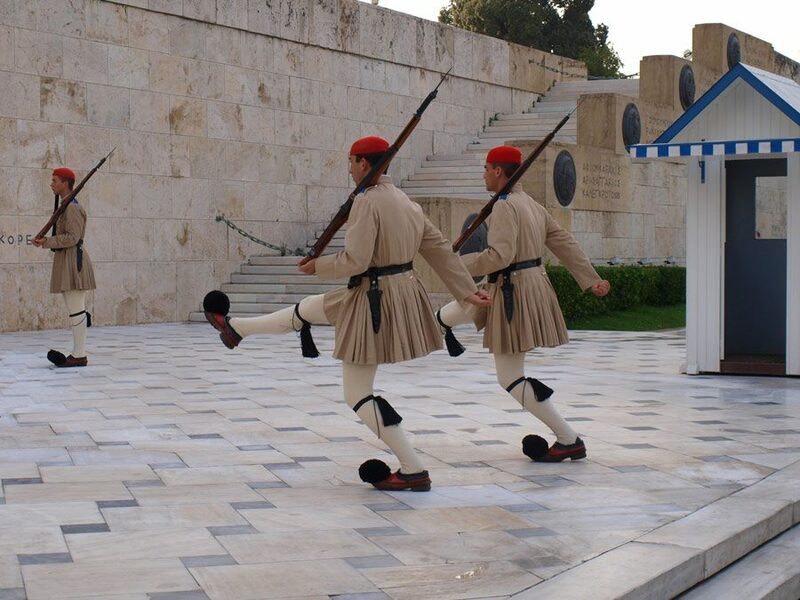 The Evzone’s duties involve guarding the Tomb of the Unknown Soldier in front of the Greek Parliament and the Presidential Mansion, raising and lowering the flag every Sunday at the Acropolis (at 9am and 6pm), accompanying the President of the Hellenic Republic on official foreign visits and welcoming foreign dignitaries on visit. Other special duties also include the annual parade on New York’s 5th Avenue in celebration of Greece’s March 25th National Day and accompanying the Holy Fire every Easter from Jerusalem to Athens. Renowned world over for their sartorially distinct costumes (inspired by outfits worn by the klephts, Greek Independence heroes), the Evzone’s uniform comprises the fustanella, a woollen kilt-like garment with its 400 pleats representing the years under Ottoman occupation (now made famous by designer Jean-Paul Gaultier); black-tasselled knee-garters, kaltsodetes; scarlet garrison caps phareon, with their long black tassels; heavy, red tsarouchi clogs with black pompons (estimated to weigh around 1.5 kgs); a cotton undershirt; white woolen stockings known as periskelides; a femeli or waistcoat; Krossia, blue and white Cretan fringes; and finally, a leather cartridge belt. Tucked behind the Parliament, a small group of skilled craftsmen work day-in day-out painstakingly embroidering the intricate details on a waistcoat (estimated to take over a month to sew) or hand-crafting the tsarouchi, hammering around 60 nails into them to make them skid-proof. This photo essay depicts pieces of the uniforms at different stages of manufacture, and regional variants of the uniform. The basic colour of the winter uniform tunic is navy blue and closely resembles the service uniform worn until 1910, while the summer uniform tunic is light khaki. Seen here, from left to right are the royal blue and red uniform based on the traditional Cretan costume (ceremonial), the blue woollen Macedonian uniform (winter service), traditional mainland or Sterea Hellas attire with a fancy gold-brocade waistcoat (full dress uniform worn on Sundays or for special ceremonies), the white cotton uniform which is the official version reserved for special ceremonies (summer service) and the black, traditional Pontic habit (ceremonial). Garrisoned in the George Tzavellas Barracks on Herodes Atticus St, it takes upto half-an-hour for an Evzone to don his uniform (with some much-needed assistance). As much as the Evzones lend these uniforms their glamour (after all, only the tallest and most good-looking get selected!) 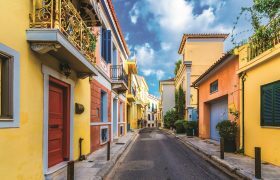 evoking a deep sense of national pride among Greeks and of pomp and splendour among visitors, it is to the unsung tailoring heroes and seamstresses who have kept alive the rich heritage of fine hand-sewing that this article is dedicated to.